I'm not really sure what I expected this book to be, but I knew that I wanted to read it. What I mean is, I wasn't sure what kind of format it was going to take or how the stories were going to be told. It's formatted like a book of poems, which makes perfect sense because some of the stories are downright poetic. Each story/tattoo has one page for the story behind the tattoo and another page with the illustration of the tattoo itself. Rather than take a photograph, which never do the tattoos justice, the curators decided to take an illustrated approach, and it's awesome. I have always wanted to get a tattoo. I have an entire Pinterest board dedicated to tattoos that I like or might consider. Maybe some day I will actually get one, but until then I'm too chicken to have something so permanent on my body; something I can't scrub away, no matter how much I love it. I got this book because I thought it might be a way for me to live vicariously through some of the contributors. The whole book took about an hour to read, and I loved all the stories. Some of the tattoos had deep, personal significance. Some of them had super shallow significance or were inked while drunk, bored, or under peer pressure. They represented people, places, mind sets, goals, love, loss of love... Some were done professionally, some in a garage, one was done in prison with a guitar string, broken cassette player as a motor, and ashes made into ink. When I read the Divergent series, I was impressed by how casually everyone in Dauntless got tattoos. ha. I was like, "I wish I could be so blasé about it and just get one." haha. 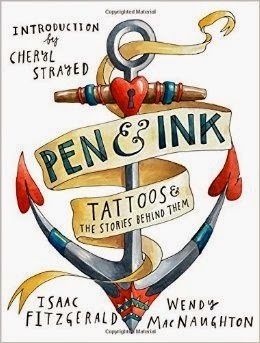 But after reading this book it made me think that if/when I get myself a tattoo, I want it to count and to mean something. I want it to be beautiful and well done. As a journalist, I have always maintained that everyone has a story to tell. This book just reaffirms that. Next time you see someone with an awesome tattoo, ask them why they got it. I'm definitely adding that to my list of questions. It's a small way to peek into the life, experience, and mindset of a person. What kind of tattoo would you get and why? Or if you already have one, what is it of and why did you get it? As for me, I've been throwing around the idea of a pirate's ship on my left forearm, right near the inner elbow. Light blue ink, like a drafting print. Some 14 years ago I started calling myself a pirate. (which is soooo ironic because I'm terrified of the sea) But I love reading about or watching pirate themed things, and pirate related things are always showing up in my wardrobe or home. Eventually all my friends started calling me The Captain, and that group of friends still refer to me that way whenever we talk or get together. I'd like to captain a beautiful ship, safely anchored to my arm though. haha.